The L. J. Scully model LS-76 (aka "THE LATHE") is the last model they built. The photo, below, shows Lawrence Jeremiah Scully , son of founder John J. Scully, demonstrating one of the LS-76 lathes. The son (L. J. S.) and grandson (Jerry) of the founder sold his illustrious patronymic to Dictaphone, who marketed audio recording equipment thereafter under the Scully badge. So, in order not to infringe on the sold name, the LS-76 would be described as having been manufactured by "L. J. Scully." It was their best lathe, in terms of automation (based on the Capps disk cutting computer) and was built using computer-designed castings. 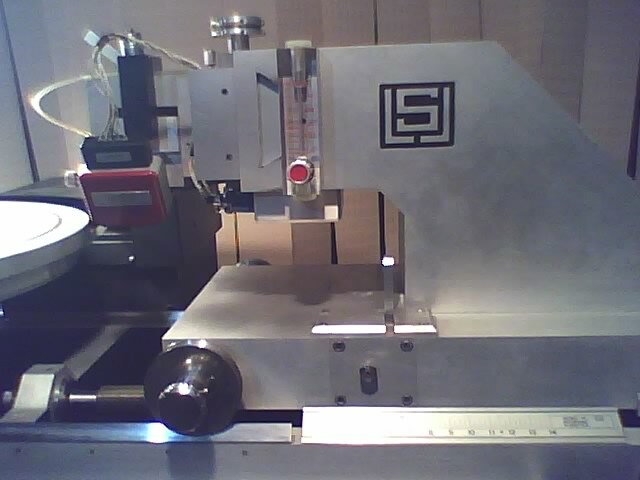 I was able to purchase THE LATHE #660 as organ-donor and test jig (for clones and mods) for #656... It was used originally by Eva Tone who made Soundsheets, which were flexis that came in magazines. Now its 16" platter is used for playing Nickel stamper mothers, with a sacrificial DJ cart. Here's a detail photo of the carriage, which is holding an Ortofon DSS 731 cutter, that happens to be designed to handle CD-4 cutting, that puts 4 channels of audio in a monogroove. Although CD-4 is cut at 1/2 speed, it requires flat response for the modulated carrier frequencies up to 22.5 kHz (which will be reproduced at 45 kHz). This cutting head has a very flat phase and frequency response (+/- 1 dB) from 5 Hz through > 25 kHz, being down by 5 dB at 30 kHz and 8 dB by 35 kHz. So, here's a photo showing the job I did on the carriage of #660. I had to replace the Brooks-Mite gas flow reduction valve/meter. I found an exact replacement for the factory-supplied model on eBay and got her done. Also, strapped on some clear Mylar belts for the turntable and feedscrew pulleys. New Mylar belts are available from Butler Precision Belts, in California. Speaking of [He] gas, which, in spite of strict rationing of late, is the most abundant element in the Universe, next to [H], it's now way easier to source (during this austerity) if you don't say it's for industrial purposes. Say it's for your clown routine delighting children or old people. *L* There seems to be a very effective Balloon Lobby in Washington. Last edited by Fonotec on 03 Apr 2013, 04:30, edited 1 time in total.